1962　Yasumoto Kajihara was born in Saga. 1989　Studied under Hokuho Daimaru. 1995　Before becoming independent, he visited and learned his skill from several major ceramic places. 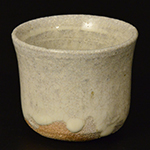 1998　He built his own kilns in Oh-uchi in 1998 and Sari in 2001, both in Karatsu, Saga. 2002　Excavated some ancient kilns in Korea. 2003　Studied ancient Korean ceramic pieces in Korea for three months. 2009　Researched The Ju kilns, Henan, China. 2012　“Korea and Japan Hoeryŏng-si Pottery Exhibition. Making Pottery at Youngsan, Korea. 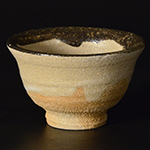 2014　Researched on the materials at Baekryeon-ri, Du-don-ri: Old kilns of Ido Teabowls.